The Logic Controls CR1000 cash drawer is built to handle the demands of busy retail operations. A sturdy design and variety of interface options make the CR1000 a smart choice for a wide variety of POS installations. 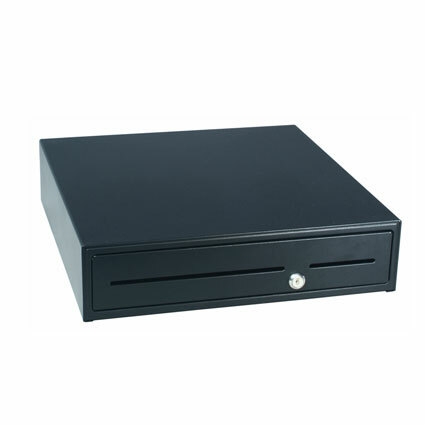 The 16" by 16" cash drawer comes with your choice of USB, RS-232 Serial, or printer-driven interfaces, ensuring easy installation virtually anywhere. The cash drawer can be powered by major printer brands including Epson, Star, Citizen, Ithaca, and more, for more traditional operation. Rough and busy retail environments can dramatically shorten the life of a cash drawer. Thankfully, the CR1000 is built with an all-metal frame and metal beams to withstand the bumps, knocks, and hits of busy use. The drawer uses ball bearing slides for smooth and long-lasting operation, promoting easy opening for the life of the drawer. With a 3-year warranty standard, the Logic Controls CR1000 is a smart choice for long-lasting operation. 16.1" x 16.5" x 3.9"
<li> 2 media slots <li> USB, RS-232 Serial, Printer-driven interfaces <li> Adjustable bill and coin compartments <li> 16.1" x 16.5" x 3.9"
Pinout: For more information about the CR1000 connector pinout, please download the product data sheet.